Hi everyone, it’s another month and once again I am here writing a few words to let you know what’s going on around in our paradise town. It’s May and we have lots to celebrate, lots of new construction and lots of good news. And talking about construction, I would like to start out with a positive note by telling you that the project to build a new cinema has been approved and will start in a couple of months. Those of you who are familiar with Cinepolis will be happy to know that we will have another option in town. Cinepolis is one of the largest movie theater chains in Mexico and we currently only have them in larger cities like Hermosillo, Guaymas, Nogales, Obregon and Mexicali. Our Cinepolis Movie Theater will be located right across from Sam’s Club (next to Hacienda Del Sol Furniture) and will have 5 theaters with 700 seats each. It will also show movies in English and Spanish, with subtitles, so you can take your friends and family no matter if they don’t speak English or Spanish – fun and popcorn for everyone! In addition to the movie theater, they will also be constructing a shopping center called “Real Center”. So, we are very much looking forward to this big new theater to see the latest hits. In case you’re in the mood for a movie now and weren’t aware, Rocky Point does, and has had, a movie theater for quite a while now. CitiCinemas is located on your way into Old Port (on the right-hand side) just past Latitude 31 (except across from it and on the side street). It was supposed to be a part of the shopping mall that is there, but the mall never came to fruition. May will also begin with Labor Day in Mexico, which is called Dia del Trabajo and all Government office will be closed – yes, the banks – so keep that in mind. Another fun event happening on May 4th is Shayna’s Birthday (from Tekila Bar). They will be having a great celebration for Shayna, and everyone else, so stop by and say Happy Birthday and enjoy the party! Then comes Cinco de Mayo, on the 5th of May, which means, of course, more partying. Then we will have Mother’s Day (Mexico and the U.S.) and the end of the month we’ll have lots of U.S visitors for Memorial Day Weekend. Mother’s Day is one of the most celebrated Holidays in Mexico and the U.S. alike, the only difference being that Mexico celebrates its Mothers on the 10th of May, while the U.S. celebrates on the 13th of May. Lots of the restaurants in town will be having Mother’s Day specials on both May 10th and May 13th. So, if you want to make your mom or your wife very happy, best to celebrate both days and take her out to lunch or dinner or both. Having two Mothers’ Days is one of the best benefits for moms living in Rocky Point. Even if you are a visitor, I think it still entitles you to both!! A very Happy Mother’s Day to our own Mother’s as well as all of you Mother’s and Mother’s-to-be out there. Summer is almost here and its getting hot and I do not like the heat! At least this year seems a little better than last year as far as heat intensity goes. Still, I think I’d rather have the air conditioning on in the car on and be eating an ice cream cone in the winter than endure the heat in July or August. And I remind you all again to get your A/C’s serviced or replaced. Wait too long and you’ll be sorry – that pretty much goes for most of our Arizona readers as well. If you need some air repair, recharge or new units look no further than the Rocky Point Times for our advertisers who offer the best prices! And we always encourage them to offer specials during the hot months. If you need a new unit or just some supplies don’t forget about Reincom, they have all the supplies you need. For service, repair and maintenance, AHS (American Home Services) does have a pre-season special in their ad for tune-ups and check-ups so don’t forget to take advantage of that. And let’s all hope we have a mild summer…I can dream, right? One thing that has come to my attention from Chef Mickey is that there is some confusion as to whether he is the owner of Mikky’s Restaurant, which is located at Laguna Shores Oceanfront Resort. He is not. His restaurant is called Chef Mickey’s Place and is located on Blvd. Fremont inside Plaza del Sol. Both Chef Mickey’s Place and Mikky’s Restaurant offer excellent food, have different menus and atmosphere, and are both very worthy if you haven’t been. Recently I was invited by Mr. Casey Luna and his wife, Bev to deliver sports supplies to the kids of two local elementary schools in town. I am very proud to know this couple and to support them in all that they are doing for the local children and for other projects they are working on. I just wanted to give them a shout out and let you know I’ll be writing an article about them in the next few months. We had a great Charanga Derby this past month – lots of teams, spectators and lots of fun. Thanks to everyone that made the event possible. The Charanga Derby benefits Casa Hogar, or as many of you know it as, the old folk’s home, so we were very happy to see the local community and visitors participate in this very fun and worthwhile event. We can’t wait until the next one! And I hope the popularity of events like this will help revive the sand drag races at Pista Los Patos and maybe even more sand races in Cholla Bay. We love to explore little towns around Mexico, especially those close to Puerto Peñasco since we can do it on our weekend off most times. Well, in the next Editorial I will tell you about “Our Day in Puerto Lobos” – and what a day it was! 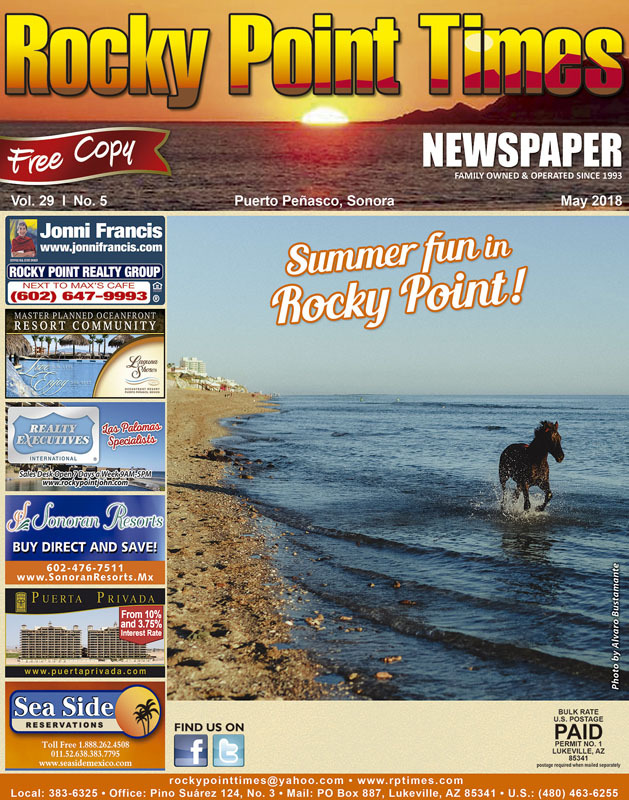 For those of you who don’t know anything about Puerto Lobos, it is a small little town about 80 miles south of Rocky Point, with beautiful beaches, and not many residents. It is so small that they’ve just barely got their water and electricity services a few months ago. So, when I tell you that our car motor decided to take a dump when we got there one early afternoon, you can imagine the day we had getting our car towed home. More on that to come. On a final note, the Puerto Peñasco Youth Orchestra and Choir Program are still in need of lightly used instruments. They especially need keyboards and violins. Maestro German Esquer currently has 23 piano students and only three keyboards. If you have a musical instrument that are just collecting dust, please contact Esquer by e-mail at: German.Esquer86@gmail.com. Generations of young musicians will benefit from your generosity. 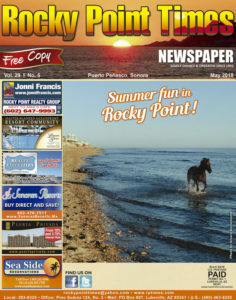 And, as always, thanks for your support and thanks for liking our page and for reading the Rocky Point Times! Have a safe and happy May! !